The American Fraternal Alliance is Born! 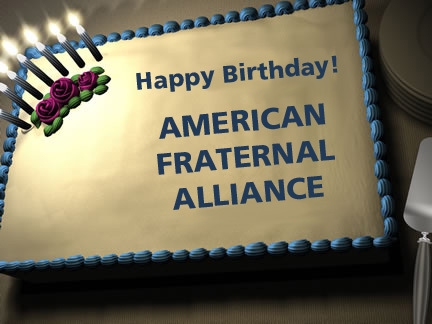 After 125 years, your association has a new name: The American Fraternal Alliance. Members voted unanimously to adopt the new name at the association’s Annual Meeting held in Chicago last week. After months of work by the six-member Branding Task Force, thorough consideration by the association’s Board of Directors, and detailed communications with members on the rationale, process, and parameters that framed the debate, the case for a new name was clearly made. The name change won’t occur overnight. We’re targeting January 1, 2011, as the official rollout date for the American Fraternal Alliance brand. Between now and then, the Branding Task Force and the NFCA staff will be working diligently to develop a new tagline and logo for the organization, complete the legal and trademarking process, secure a new URL for the Alliance’s Web site, and update all our internal and external documents, so when we make the transition to the new name all our “touch points” with our key audiences – members, public policymakers, and opinion leaders in the news media – will have a clear and consistent brand. We’ll also be assisting State Fraternal Congresses to take the steps necessary to change their names to State Fraternal Alliances. Thank you all in advance for your patience during this process. The new name does not change who we are and what we do. After all, it’s what’s under the hood – not the hood ornament – that’s important. The American Fraternal Alliance name does give us the opportunity to create brand awareness for the fraternal system that does not currently exist. Our challenge is to make sure our new name carries with it the brand identity that says fraternals are credible, trustworthy, and relevant financial services providers and that our non-profit, mutual aid charter delivers a valuable and irreplaceable return on investment to taxpayers through our charitable and volunteer activities, and by building social capital that strengthens communities across the country. Your association will lead this ambitious effort; but we need the support of every member society to accomplish our objective. Congratulations folks. It’s the dawning of a new day for your association and the fraternal system!